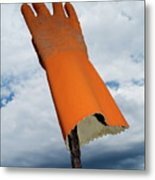 Orange Rubber Glove On A Wooden Post Against A Cloudy Sky by Sami Sarkis - 6.750" x 10.000"
Orange Rubber Glove On A Wooden Post Against A Cloudy Sky framed print by Sami Sarkis. Bring your print to life with hundreds of different frame and mat combinations. Our framed prints are assembled, packaged, and shipped by our expert framing staff and delivered "ready to hang" with pre-attached hanging wire, mounting hooks, and nails. That is really unique! Congratulations! FAV! 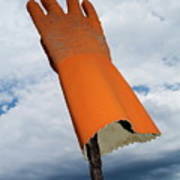 Orange rubber glove on a wooden post against a cloudy sky, France.